From mammaries last week to Mams today. Because its Mothers Day, and I’m missing mine, I want to share a little story about this medal. When she was alive, my mother’s wishes were a frequent source of confusion and sometimes exasperation to me. Now, when all the small stuff is just irrelevant and pointless, the big stuff is clear. Since she died in October 2010, I’ve come to appreciate more of what she left behind, including a very large, largely loving family. She encouraged me to write, enjoying writing short stories herself and I could write a book about her, but here I want to distil the essence of her wishes, her legacy. She was remarkably resilient, passionate about children, life-long learning, social justice, Manchester, the hills of Glossop where she was evacuated in the war, and helping others. She saw people as human beings regardless of colour, creed or status and she demonstrated that compassion creates the conditions for forgiveness. She was involved with the MC Brothers co-founded by Mother Theresa, who live amongst, to serve and support, the poor and disadvantaged. When we were clearing her home after her death, I found eight Mother Theresa medals, one for each of her children, identical to, though not the one in the photograph above. Several weeks ago, something was preying heavily on my mind one night. The next morning, my son and I were returning from an early walk with the dog. It was still quite dark, with just the fingers of the rising sun stretching across the sky, when my son pointed to a shiny object on the pavement outside our house. 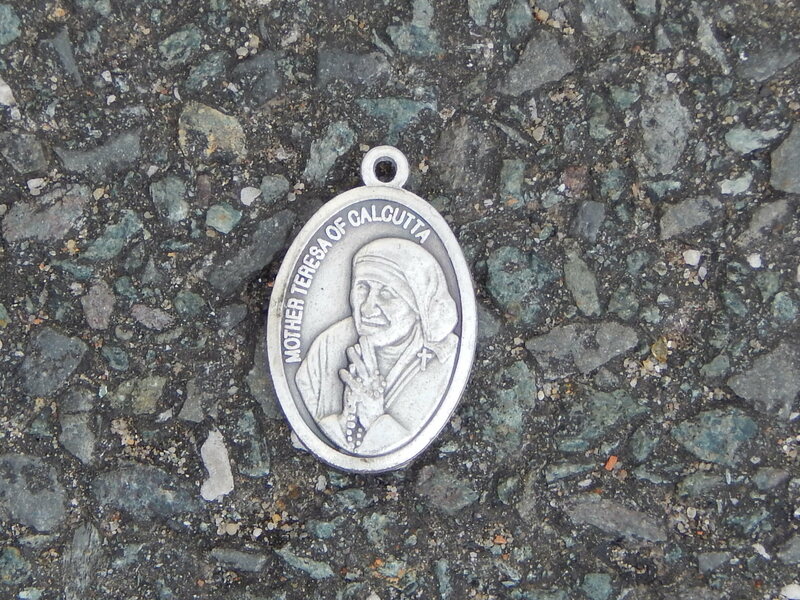 It was the Mother Theresa medal in the picture, which conveyed to me an immediate message of comfort, support and love. Coincidence? If so, an extraordinary one, given that few pedestrians apart from walkers tread that pavement. The important thing was that as soon as I held it, I knew all was well. If everything is energy, then love is, I believe, “the highest vibration” and its legacy eternal. Wishing you all a happy and loving Mother’s Day today.